Epoxy grout has long been the preferred choice for commercial kitchens. However, since the onset of “no-rinse” enzymatic cleaners were introduced, an increasingly common issue reported by facilities departments and restaurant operators, is the all-too-common problem of grout deterioration. A simple internet search regarding enzymatic cleaners and grout problems yields a plethora of horror stories, and many grout manufacturers going on the defensive about what is causal to this issue. In some cases, grout that was only a few months old, had completely deteriorated and a total replacement imminent. Grout deterioration creates various maintenance issues that can be challenging to both the staff, and the cleaning crew. In addition, it also increases the risk of unwanted sanitary conditions, as bacteria and foreign agents thrive in low dwelling joints and hollow voids deep below. Not enough of a concern? Slip/fall hazards are exponentially higher as the floor surface becomes increasingly uneven and problematic. These are all factors that can manifest into superfluous liability and exposure. Direct hard costs associated with grout degradation, range from a re-grouting of the floor, to a total floor replacement; not to mention any indirect costs related to shut downs and lost revenues. Designers and end users in restaurant chains spend tremendous time and energy seeking and specifying the correct tile aesthetic for their unique brand. However, we have found that considerably less time is spent on choosing installation and setting products that are appropriate for the type of environment it will be exposed to. If the proper time, planning, and research had been spent upfront selecting the correct setting materials based on performance requirements and maintenance protocols, costly repairs and rip-outs would have been eliminated, or at the very worst mitigated. In fact, there are varying types of epoxy grout which differ based on their respective technical characteristics. Regardless of the brand of setting materials used, all of these respective manufacturers state that non-industrial grade epoxies (ANSI A118.3) are not recommended for commercial kitchens if exposure to “no-rinse” enzymatic cleaners are inevitable; only industrial grade epoxies meeting or exceeding ANSI A118.5 should be used in these environments. The reason industrial grade epoxies should be used, is due to certain environmental conditions typically present in commercial kitchens – namely the presence of oleic acid. Oleic acid, a mono-unsaturated omega 9-fatty acid, is a by-product of animal and vegetable fats and oils. This type of acid has been found to break down various types of tile grout when left to dwell in higher concentrations. 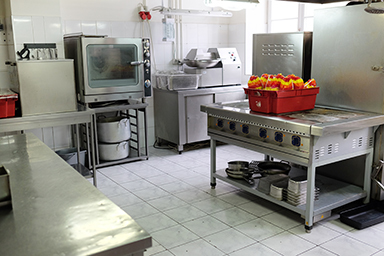 While oleic acid has always been present in commercial kitchens, the prevalence of grout deterioration prior to the emergence of “no-rinse” cleaners was almost unheard of – because previous cleaning methods required cleaning, mopping, and, most importantly, rinsing. These steps were not voluntary, but rather a prerequisite of the overall maintenance procedure. This strategic removal allowed for oleic acid buildups to be fully removed before it had time to dwell on the grout and wreak havoc on the system. With a change to “no-rinse” cleaners, we found that restaurant operators were no longer rinsing their kitchen floors after cleaning (as the name “no-rinse” cleaner would suggest). Important to note, the manufacturers of these enzymatic cleaners state in their product literature, that rinsing is still an important step in the maintenance process. However, upon conducting site visits for many of our clients, we found that in many cases, the floors were not being thoroughly rinsed or even rinsed at all, for that matter, which ultimately lead to costly failures. In light of these issues, independent tests were conducted by national cleaning and chemical consultants, in conjunction with leading grout manufacturers, to test various grout products when exposed to oleic acid and the introduction of enzymatic “no-rinse” cleaners. The results of those tests identified, that when oleic acid was allowed to dwell on most types of grout, including the non-industrial variety, the grout was found to have deteriorated. To combat this issue, grout manufacturers went back to their chemists to create even stronger epoxy grouts, namely industrial grade. Upon additional testing, industrial grade epoxy grouts were able to withstand erosion and degradation when faced with high concentrations of oleic acid. In summary, while it is important to use epoxy grout in a commercial kitchen, only high-performance 100%-solids epoxy grouts must be used. These specialized grouts must meet or exceed ANSI A118.5 standards and provide strong resistance to oleic acids left behind. An equally important aspect for all restaurant chains to consider, is that the firm’s A&D team, along with the collaboration of the design and engineering specialists, need to be in close communications with the respective operations teams. This will ensure that the appropriate products are specified and installed. Instead of the grout specification being an afterthought, proper research and planning as it relates to the type of epoxy grout needed, should be a vital part of the selection process. This step is extremely critical, as it will minimize unwanted surprises and costly setbacks, thus paving the way to a successful grout system. Learn how you can ensure that the specified setting materials actually get used by reading the Specification Enforcement section of our How We Build Your Tile Supply Program page.